100 degree temperatures hit parts of the Midwest much earlier than normal this year. Those temperatures created warmer water, and the warmer water has fish moving, and they’re also hungry. In early summer different species of fish are doing different things, and they can be moving around quite a bit. The fish will bite if they see our bait, we just need to get it in front of them. Kind of an old school way to catch fish right now is forward trolling with a couple of different types of baits. Old school maybe, but still very effective. Here’s how you can catch more fish right now and for the rest of the summer by trolling. Trolling is especially good if there are inexperienced anglers in the boat. The boat driver needs to keep the boat in productive water, but everyone else just needs to watch their lines to keep them out of the motor. And they need to hang on. Strikes are not subtle, there is no mistaking them. You can hold onto your rod or put it in a rod holder: Either way works. We’ll be using a couple of different bait styles. To cover water quickly, crankbaits are tough to beat. Almost every species of fish will eat a crankbait, and crankbaits are available in so many colors, sizes, and shapes. This variety enables an angler to try different options until the best option is made apparent by fish bites. Troll cranks along weedlines for a smorgasbord of fish: You’ll catch walleyes, bass, pike, muskies and panfish. When you’re on a multi-specie lake, a Lucky Shad is an outstanding crankbait to tie on. It’s a longer, thinner crankbait, and longer, thinner crankbaits seem to appeal really well to longer, thinner fish like walleyes and pike, but bass like them too. Trolling a weedline can be a bit tricky as weedlines don’t run in a straight line. You’ll have to clear weeds from your baits every now and then, but when you hit it right, you won’t mind. If you’re on a walleye lake, trolling with spinner rigs tipped with nightcrawlers is an outstanding way to go. Northland Fishing Tackle produces several different spinner rigs, but their new Butterfly Harness has been producing outstanding summer catches over the past year. We’re pulling these rigs over deeper structures with sand or rock bottoms, more traditional walleye areas. A Rock-Runner Bottom Bouncer is used to get the rigs to the bottom, and we’re trolling much slower than we would with crankbaits. When trolling cranks it’s not unusual to go 2 miles an hour and even faster: With these rigs it’s slower than a mile an hour, sometimes much slower. Just make sure you’re going fast enough to keep the spinner spinning. If regulations permit, get extra lines in the water and spread them with planer boards. This enables us to experiment with colors and blade sizes, and extra lines increase the odds of showing the fish what they want. Off Shore Tackle makes the best boards for a wide variety of applications. 10 or 12 pound test is about right. Line that’s tough but has some stretch, some but not too much, is the way to go. P-Line CX Premium is an outstanding choice. After a winter that hung on way too long, summer made a quick appearance. Trolling is a great method for taking summer fish. When you’re on the water in the next 3 months or so, give it a try to find out for yourself. Feature Image: You never know what’s going to eat a trolled bait in the summer. 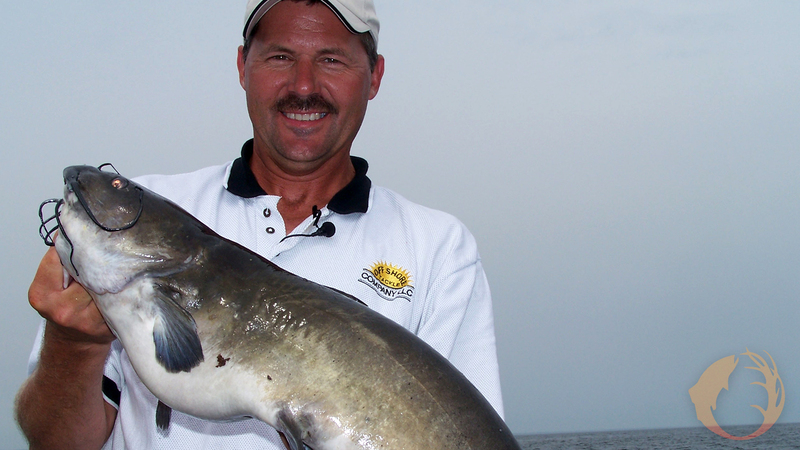 Dean Arnoldussen took this giant Green Bay catfish while fishing for walleyes with a crawler harness.